In this unique story, Nobody Owens, or "Bod," was barely a toddler when his entire family was murdered. Luckily the baby toddled up to the graveyard up the hill while the door was open and in a fit of generosity, the ghostly denizens of the place decide to keep and raise the baby and give him the "Freedom of the Graveyard." 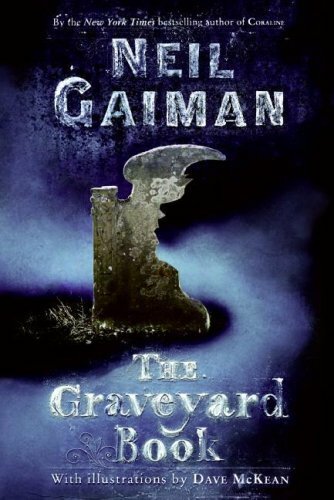 Bod quickly becomes accustomed to life in the graveyard, since he can remember no other life. Much like Mowgli in The Jungle Book where the jungle animals instruct the boy in their ways, the ghosts teach Bod what worldly things they know, as well as how to do ghostly things, like Fade, Dreamwalk, and see in the dark. But when Bod becomes old enough to begin to wonder about the world outside, he discovers that he is still in danger from "Jack", the man who killed his family, and that a graveyard's protection only reaches so far. But a boy can't stay in a graveyard forever. Can Bod face his enemy and learn to live in the real world? This book is in turns fascinating and exciting and readers will be drawn in and love it. Destined to become a favorite of the Newbery Award winners. Readers may wish to try out Gaiman's other famous creepy novel, Coraline, or want to pick up his inspiration for this book, Rudyard Kipling's The Jungle Book.